In my opinion, television is the number one reason TCU and Utah are moving to automatic-qualifying conferences and Boise State is not. TCU brings the 5th largest media market, and Utah the 31st. Boise State? Well, its media market ranks #120. Other factors come into play when conferences realign: does the university offer academics comparable to the other members of the conference? Does adding the school open up new recruiting territory for the conference? Are philosophies the same? The latter is the reason BYU is best off as an independent. What isn’t a deciding factor? How good the football program may or may not be. If it was based purely on football acumen, Boise State might be in an AQ conference. But Boise State doesn’t have a top media market or fertile recruiting ground. Conferences are asking, “What can you do for us?” and Boise State doesn’t have an answer. Even if the move to 16-team super conferences came to fruition as many have speculated, Boise State is no one’s target. The SEC, Big Ten and Pac-12 would go after the most attractive targets in the Big East and Big 12: Texas A&M, Oklahoma, Rutgers, and Missouri. Teams like Oklahoma State and Texas Tech can likely ride the coattails of Oklahoma and Texas A&M into conferences. Texas will be an independent by then. Why would any conference add Boise State? Why would the members agree to a smaller slice of the pie to add a school that brings virtually nothing to the table in terms of media market or recruiting ground. This isn’t a personal attack on Boise State. I’ve been impressed with what they’ve done on the football field, and I look forward to seeing how they do against stronger opponents in the future. Their season opener against UGA is probably the one football game I’m looking most forward to this fall. But unfortunately, I don’t think there’s much they can do to improve their situation in terms of their conference home. Which Is More Important: Booster Contributions or NCAA and Conference Distributions? This is not a good business article. Weak on facts & research. Weak on business principles. Weak on analysis. You do not have a future at the WSJ anytime soon. It’s a blog…and she’s correct. As far as facts go, she pretty much told you everything you need to know. It’s about eyeballs watching tv. I do not understand your claim against this article premised upon weak business principles? 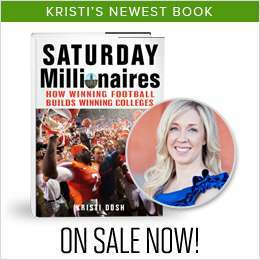 As much as I would like to see Boise State within the confines of an AQ conference, Kristi is right on with her analysis in regards to what infirmation the various conference commissioners utilize when differentiating upon which schools to lend offers to. I may not agree with the format utilized, but it is the reality of the business dealings in inter-collegiate athletics and the over-commercialized state that they have placed themselves. Unfortunately, FBS champion is also determined by these same business rules rather than level of play on the field. It’s okay for conferences to be aligned based on TV markets and revenue generation, but when it comes to determining the champion, we should ignore the business rules and look at the game of football. wow…you really went out on a limb with this theory. Considering everyone else knew this a year or two ago Seriously! Who is Kristi Dosh? And who cares? This site is probably visited by at leas 23 people each week. You visited it, did you not? Please notify me upon the opening of your website and/or blog. I would like to read what you have to say with regards to business dealings in inter-collegiate athletics! May I have my time back that I invested reading that article? You posted few facts, which is fine for an opinion piece, but neglected to look at true measures. Boise State is more than a football program. The school’s academics have and are changing dramatically. And television appeal goes beyond geographic borders. Boise State consistently draws strong viewership numbers showing that their appeal cannot be measured by media market. And as for the appeal of TCU, do you really think they deliver the DFW market? Do schools like Pitt or UCLA or any of numerous programs. Simply being located in a region says little about market appeal and ratings are the measurement national advertisers use to make media buys. This isn’t cable. I’m still waiting to hear reasons why Boise State hasn’t been asked to join an AQ conference if my theory is so wrong. And why were TCU and Utah more appealing? There are a lot of teams in BCS conferences that do not meet your standards. What about Washington State in Pullman? TV sets, market share, etc.? I bet Boise State brings much more viewers to the TV than many teams from BCS conferences. Just look at last year’s V Tech game. Utah backed into the PAC only because the Texas deal fell through. Boise State is a stronger football team than Utah. Do you remember last year’s football game. TCU like Boise State would jump at a chance to go to a BCS conference, which it did with the Big East. Is the Big East a tough football conference????? The champion of division 1 football is the only sport not decided on the field (playoff). That is truely a sad fact. Washington State joined the conference in 1917. I’m talking about why you add someone now. Still waiting? Okay. Let me try. Boise State lacks the academic chops to get an invitation from the Pac 12. Since the mid-90s, the Pac 12 (nee Pac 10) has shown that the presidents run the expansion show. To these people, academic philosophy and programs matter. What school, academically, does Boise State look like? Oregon State is the most likely prospect. Unless the University of Idaho morphs into the academic version of the University of Oregon do not expect BSU to get an invite from the Pac 12. Remember, the University of Utah was only added to the Pac 12 because (A) Colorado committed to joining and (B) the Texas schools dropped out of the process. Yes, Utah’s academic profile and PhD programs exceed Boise State’s. The Big 12 and the Big East. Come on down. You are the AD at Pittsburgh (oh, hell. You can be the AD at Mizzou; this game will have the same outcome). It is Sunday. On Monday night, your volleyball team has a game in (A) Fort Worth or (B) Boise. Which school boasts a large enough airport that your volleyball team can get a direct flight or a flight with one stop? TCU! That’s right. The Fort Worth campus is about 30 to 45 minutes west of DFW, one the nation’s five busiest airports. Heck, in the Big 12, even the volleyball teams take chartered flights. Do you want to charter a flight from Manhattan, KS, to Boise or to DFW? Besides the attractiveness of the airport, TCU’s expenditures on athletics and its endowment are much, much larger than BSU. Hell, BSU had difficulty expanding its nice, small stadium. How many phone calls do you think TCU’s AD made to expand Amon Carter? Two? Four? BSU’s athletics budget is minuscule compared to Utah’s and TCU’s. Finally, BSU has only football to offer. Utah has a competitive men’s basketball program that draws good crowds. TCU has a competitive baseball program (have you noticed how much of a draw college baseball has become). After football, what else does BSU compete in? Television market has nothing to do with it. In the DFW television market, TCU is, at best, a fifth story on the nightly television show after the Cowboys, the Mavs (or Rangers), the Texas Longhorns, and Texas A&M. Hell, high school football gets more coverage in the DFW market than TCU football. Recruiting has a little more to do with the expansion decision but not much. UCLA will get a Rose Bowl berth because it can finally (FINALLY) recruit the Salt Lake City market. Really? If Texas were that big of a deal as a recruiting market to the Big East, then it could have added Houston. UH has the airport and better academics (based on research money generated) than TCU. However, Houston has zero fan support and even less interest from the citizens at large. Further, the Houston’s stadium is smaller than TCU’s. Finally, UH has as much success in other sports as BSU does. Endowment along with athletics expenditures, academic prestige, and airport drove the decision. That’s your argument. Not television and recruiting. Lots of good points, bevo. I still think location is the number one factor though. You think a conference doesn’t get a bump in tv money if it expands into Texas? Not to mention expanding recruiting reach of conference into a state like Texas. While I understand that local markets are a key component of TV contracts. Here is my question. Who draws more viewers in bowl games and regular season games between Utah and BSU? BSU has beaten Utah when you take into consideration equal bowl games and similar regular season games. BSU has the highest rated ESPN game since ’93. Do you really think BSU would be a tough sell as far as the TV side? I could sell BSU over Utah as far as tv value and it would not be horribly difficult. National viewership is way more important and profitable then local. See Notre Dame and then get back to me. Does Notre Dame have the most lucrative tv contrat because of Chicago? Ask ESPN, they have selected BSU as one of their prime time first weekend matchups 3 years in a row. Georgia BSU has yet to be seen as far as ratings but Vt BSU and Oregon BSU received huge ratings. Your recruiting argument is pretty weak. Let me know when Rutgers, Syracuse, Pitt, West Virginia, UConn and other Big East schools have a significant # of Texans on their roster. It will happen pretty much never. They will stay in Florida and southeast primarily. Big East is in survival mode and took the best and closest option. They invited Villanova. Tell me how they mesh with your master plan. It doesn’t make sense. They are in survival mode. Try to sell the small private Philly school angle and try and forget they dropped that by dropping Temple. Academics is the most important since the most likely conference to look at BSU is the PAC-12 and other then the Big 10 (12 now) no conference values academics and culture more then the PAC. Your blog is basically a repeat regurgitated article that is old, tired and full of half truths. You want to write something meaningful and edgy? Write about how big of a joke it is that teams like Miss. St., Baylor, Washington State, Iowa State, Vandy, Duke (in football) and others get to stay in power conference when they offer anything but power in ratings, performance or local backing. If your argument were true put BSU on the east coast with the exact same market, and scenario with recruiting and academics. Big East would have snatched them up, and the ACC probably would have looked at them. Misfortune of being in the PAC footprint is ironically their biggest problem. Just throwing this out there, if Boise was moved to a bigger and better conference. They would attract better players. They would eventually succeed in the conference and generate more revenue… Even more fans. The team’s budget might grow and they would possibly build a new stadium to hold more people. That still has nothing to do with academics. Hope this helps. Boise state is not known just for football. Yes, football is more popular and what people recognize us by. But we do have sucessful volleyball teams, basketball teams, soccer teams, softball teams, tennis teams and our wrestling team is ranked in the top 10 in the nation. Oh and btw, if you didnt know, our wrestling team is in the PAC-12. Boise State gets great attendance at all sporting events. I try getting tickets at any Boise state game and its hard to do. No we dont sell out every game like lets say a Nebraska or a Oklahoma. But we do have 90% of arena/sporting complex’s filled to capacity. And if we want to get on the recruiting side of things, Boise States 6 out of 12 recruits I believe it is have commited from the state of Texas for the 2012 class and 1 Quarterback from Florida. You’re right that Boise State does a good job recruiting…but the issue when it comes to conference realignment is whether there is fertile recruiting ground where the school is located: Idaho. You are right. Recruiting and population as far as markets is the down fall. Who would take 1.7 million population for the state and 13 total NFL players as of 2006 which shows how terrible the recruiting grounds are? Oh wait, that is Nebraska and they were just taken by the Big-10! OOOOPPPPSSSS! Idaho Population is 1.55 mil and had 10 NFL players in 2006. Again your reasoning has a ton of holes in it. Plain and simple wrong place at the wrong time. And reality if conferences worked in their best interest Washington State should be dropped and BSU added. Omaha is a market in the 70s, not Boise’s 120. Also a long-time national brand. Definitelty (and obviously by Big Ten’s decision) a more attractive addition. For those arguing ratings, that’s not what this is about. It’s about market penetration. It’s about the market you get the conference into (both in terms of media and recruiting), not the viewership of a single school. My nephew was offered football scholarships in the double digits. Schools such as Georgia, TCU, SMU, Nebraska, Hawaii, UCLA, USC, Minnesota, Oregon St…well basically most of the Pac-10 and then some. His Choice : Boise. He knows a great program and great coaches when he sees em. Tired of all the haters and doubters. Boise can pull the recruits. Interesting perspective here. College football is very much a business and the majority of the big money is in fact coming from Television, so it makes sense that TV would play a vital role in conference alignment. I’m’ not really sure what other “facts” other people are looking for here. It seems to me the that the only fact needed is the size of a television market, and that was provided. If that is enough information then you must be disagreeing with the portrayal of college football as a business with televison dollars trumping most other funding. Again, if you disagree, what is more important? I’m sure Boise State offers other great athletic programs (like Derek said) but would the ticket revenues of tennis, volleyball and wrestling rival that of a major conference TV deal? I doubt it. For most universities I assume that football and men’s basketball are the leaders in athletic revenues (although I admittedly could be mistaken). It’s hard to imagine other sports doing much to stay in the black. As for recruiting in a larger conference (Bailey’s point), I’m not sure that a bigger conference would directly correlate to better recruiting. It certainly might help, but I think that is far from a guarantee. The major knock on Boise State football currently is the lack of competition on the Broncos’ schedules; if that suspicion was confirmed then the Broncos’ recruiting classes might actually take a hit. I think most high school players would prefer to play for a 12+ win Boise State team that is always in the national spotlight but has to go undefeated to play in a BCS Bowl than an 8-4 Boise team that is consistently playing in low-level bowls and struggling to finish in the top-25. Maybe I’m naive but this viewpoint made sense to me. Again, the national championship should be decided on the field, not according to which conferences generate the most revenue or TV sets. This is just plain wrong. Thus, Boise State will always merit inclusion into BCS bowls and have a shot at even getting into the title game if things break there way. They can do this in the MWC. Though they don’t have a built in local audience, the idea that Boise State isn’t a highly valuable television property is absurd. Thanks to years of promotion from ESPN, and a quirky, easily identifiable signature in the form of their famed blue turf, Boise State is a true national property. They have a certain cache that TCU, Utah, and BYU don’t. They have an appeal, in fact, that many BCS conference teams envy. This is like saying Nebraska wouldn’t be attractive to a power conference, even though their local TV market is equally puny. Go track the ratings for the Broncos on ESPN over the past five years. They consistently have outperformed many BCS conference teams. Also, their viewers tend to skew younger, as their anti-establishment platform appeals to the advertiser-coveted 18-34 demo. The stadium, to me, is the main reason that Boise State has received a power conference invite. Geography and academics also play a role, but I think some of these teams have trouble getting past the idea of playing in such a small stadium. But to argue that the Broncos wouldn’t bring EXTREME value to any conference in the country from a television standpoint is patently ridiculous. Good post Miss Biz! I do however think Boise may have a point. I understand the metric that most people use is the local TV market but I’m not sure that’s the best measure. I live in rural Virginia and like to watch Boise’s style of play and I’m a sucker for the underdog. It seems to me if the TV ratings are there when Boise’s playing games against AQ conference teams, maybe the AQ conferences should be taking note. Another example I would use. West Virginia is not the biggest TV market or recruiting grounds, but consistently have the best TV ratings in the Big East. It seems to me there should be a place at the table for these teams. I look forward to seeing you mega conference breakouts in the near future. Maybe it’s time for a ruling body (NCAA?) to play a roll in conference alignment. I know fiscally why that’s not happening, but it would certainly make sense to have one ruling body as opposed to 4-6 super conferences. What is apparent about your research is that you don’t do much and you don’t think about the rationale behind your response. Boise as far as Neilsen’s is concerned is 112th at 226,000. 76th Omaha’s is 411,000. Within 20 miles, or the valley, Boise metro is right around 500,000 probably closer to 600,000. Nebraska and Idaho are almost identical in their setup. Idaho’s population is a little bit spread out but they draw in Idaho. The reality is any argument you make can’t include how appealing and awesome the Nebraska tv market and recruiting base is which unfortunatley is the basis of your blog. Listen to your argument. You are trying to say that the Big-10 was salivating over the 76th biggest market? Really? That makes absolutely no sense. If market size and recruiting were the draw the BIG-10 would have taken TCU without even thinking about it. Unfortunately you have taken a firm stance that market size and recruiting are two of the three biggest reasons for exclusion. Nebraska being among the most sought after universities in the last go round unfortunately blows the majority of your theory out of the water. And if you want to talk about Nebraska being the bigger draw for TV nationally then why did the SEC championship game barely get 2nd just ahead of BSU vs VT for the most watched regular season game? BSU’s problem is the wrong university, in the wrong location at the wrong time. Again if they were located on the east coast with their figures, chances are they would have a BCS home just like TCU. I am still waiting for your Villanova is way better then BSU argument. Cause that is who the Big East invited. FBS Villanova or as I call them the other Temple. Your last post goes against your blog. Nebraska’s draw is national recognition (and has nothing to do with local market size), so while you won’t admit it, national draw trumps local markets. Also your blog states the number one reason is television. As far as ranking where would you put BSU as far as national draw or dollar potential. BSU is probably top 25 or close to it. Their underdog status with the right matchups makes them a top draw with the right opponent. Which by the way should be the argument when it comes tv revenue. UConn and USF got BCS invites and they barely had started football programs. They still draw jack. BSU has a huge national following. So who draws more national attention, BSU, TCU or Utah. BSU is not difficult to show it is more then likely the top draw of those three, making your biggest reason completely false. Your blog leaves out a considerable amounts of detail which has made it difficult for BSU. Your blog was poorly thought out, didn’t give anything new or insightful, and showed you didn’t really think very hard about the true reason for BSU’s exclusion. They are profitable enough that BSU is pretty much ESPN’s must have in great early season matchups, not TCU or Utah. TV revenue is not the reason as you want to believe for BSU’s exclusion, and ESPN could probably tell you that, because they make the payouts and they are willing to pay top dollar for a BSU regular season matchup. Local markets is an archaic rationale when national names drive the dollars (your own Nebraska response proves that). Recruiting is becoming less and less about where conference opponents are located since media has made this country so much smaller. Texas being one of BSU’s prime recruiting grounds shows you how important it is to have conference mates in a certain area. Old argument less true every day again. Your argument about academics is unfortunately correct, but only because of the BSU’s location in the PAC-12 foot print. The biggest flaw in your argument using ESPN is that ESPN is the contract holder for the WAC. They’re going to pick someone to show – who else would you show from the WAC? It’s not like ESPN is shelling out extra money every week to grab up Boise State games. For the 2011 season, Boise State is on ESPN on two Friday nights and one Saturday night. The Saturday night is because they play UGA. During the 2010 season they were on for a Monday night, several Friday nights and two Saturday nights – one against Oregon State and one on ESPNU. ESPN isn’t picking them for Saturday prime time games unless they’re playing opponents from AQ conferences. Yes, ESPN likes them. That’s because they’re underdogs. When that goes away so does the ESPN exposure and national attention. They have not yet built up a national reputation you can say they’ll sustain for the long term. Again, it’s not about tv ratings. It’s about market penetration. What would Boise State bring to the Pac-12, who already has a tv contract with ESPN? Nothing. What is apparent about your research is that you don’t do much and you don’t think about the rationale behind your response. Boise as far as Neilsen’s is concerned is 112th at 226,000. 76th Omaha’s is 411,000. Within 20 miles, or the valley, Boise metro is right around 500,000 probably closer to 600,000. Nebraska and Idaho are almost identical in their setup. Idaho’s population is a little bit more spread out but they draw all Idaho roughly equal size to Nebraska. Negligible difference. The reality is any argument you make can’t include how appealing and awesome the Nebraska tv market and recruiting base is which unfortunately is the basis of your blog against BSU and Nebraska stongly counters that. Listen to your argument. You are trying to say that the Big-10 was salivating over the 76th biggest market? Really? That makes absolutely no sense. If market size and recruiting were the draw the BIG-10 would have taken TCU without even thinking about it. Unfortunately you have taken a firm stance that market size and recruiting are two of the three biggest reasons for exclusion. Nebraska being among the most sought after universities in the last go round unfortunately blows the majority of your theory out of the water. Reality BSU draws as well as a majority of the BCS schools, market size and recruiting are convenient excuses for people like you to swallow and regurgitate and not think about as far as the injustice of not inviting BSU. And if you want to talk about Nebraska being the bigger draw for TV nationally then why did the SEC championship game (10.2 million) barely get 2nd just ahead of BSU vs VT (9.9 million) for the most watched regular season game the whole season? BSU’s problem is the wrong university, in the wrong location at the wrong time. Again if they were located on the east coast with their resume, chances are they would have a BCS home just like TCU. I am still waiting for your Villanova is way better then BSU argument. Cause that is who the Big East invited. FBS Villanova or as I call them the other Temple. The point of this article is old news. All you had to do was scour ESPN and CNN to come up with these ideas cause it is an old debate. As far as the WAC having to show somebody, ESPN did those deals with the WAC b/c of BSU, not in spite of. They wanted to show BSU b/c our ratings are quite good. Part of that is b/c of ESPN, a larger part is b/c we play exciting football and you never know what you will see. Nobody at BSU is expecting an invite to the PAC12. Some of the reasons are because what you have listed. But there are other reasons also. So I am confused why you even wrote this article? No, I don’t read your blog, I got linked to it and never will read it again. If you are going to write a business article, write something informative that may take a little research. Bring something new to the table. A different angle? Your post is the equivalent to me writing an article against Keynes. Like that has never been done before? Without anything new to the topic, you just come across as jealous BSU hater. Adelphos said why Boise won’t get the invite…their fans travel once, maybe twice a year. I think any rational fan of college football can agree that Boise wouldn’t be undefeated or a 1 loss team every year if they were in the PAC, or magically moved to the eastern US and joined the SEC, Big Ten or even ACC…maybe the Big East. Playing a big boy team the first game of the year and then having over a month to prepare for another one in a bowl game isn’t the same as playing top tier teams in a murderers’ row of a schedule…and pointing out that the top teams play 1, 2 or even 3 teams below their level of competition doesn’t change that fact. Sure Boise gets eyeballs and underdog fans all over the country but if you change the current system by throwing them into a real conference they will lose their novelty appeal and become just another mid-major David that occasionally wins against a Goliath. The BCS powers-that-be will never let a team with the fan base the size of Boise State get into the BCS Championship. Sorry, but the game is rigged against you. An undefeated or even one-loss AQ school will magically move into the 2 slot to push you out regardless of you going undefeated. You can’t change your geography (unless you’re Wake Forest…old joke) and you can’t build a bigger stadium if you don’t have paying customers to fill it. Start getting more fans in your house than East Carolina and Central Florida and maybe the big boys will take you seriously. Frankly, those schools are more attractive additions to an AQ conference in spite of your wins and losses. If ECU joined the Big East, ACC or SEC they could add on to their stadium and get their average attendance up from almost 50k per game(with a much worse record than Boise to boot) to easily in the 60s or even 70s. If Boise joined the PAC or Big XII they could expand and still maybe draw 45k with half being fans of the opponent. I understand you have a winning football tradition at Boise that goes back an entire decade and includes a handful of victories against the most notorious BCS chokers during that period – Va Tech, Oklahoma and Oregon. Appalachian State beat Michigan in The Big House in the first game of the season some years ago. That doesn’t mean they could ever win the Big Ten. They also didn’t start getting 80,000 fans in Boone, NC every Saturday. TCU wins the battle of geography which doesn’t change based on wins and losses, recruiting classes or coaching staffs. Maybe someday soon Boise will be a more attractive market and they will get that golden ticket invite to play with the big boys. I hope they do! This analysis on lack of traveling fan base is very incorrect. BSU typically has 6 road games not 4 or 5 like most SEC teams, and Big 10 teams. Also BSU regularly travels to 4 time zone and sometimes 5. We are a great traveling fan base. We only got 7,500 tickets for DC last season and we had close to 10,000. We have only 7,500 for Georgia and sold out. 15,000 to Washington. 7,500 to Oregon State. 7,500 to Utah. 10,000 to Nevada. 10,000+ to Utah State. We regularly get 4-5,000 to Fresno and that game is almost always on a weekday. So you have to take time off. We also got 30k-35k to the Fiesta Bowl both times. I think it is halarious for fans that have teams that don’t even travel out of state for decades or rarely do to be attacking a team that get’s shipped across country regularly. Then to say we don’t travel well is not accurate at all. I have attended a game in NMSU 2 times. BSU’s attendance for that horrible opponent in the middle of nowhere with no close major airports was better then BC, Miami, Virginia and Georgia Tech to their bowl games in Boise. You can say how bad the Bowl game to Boise is, but your point insinuates that the BCS title somehow automatically means traveling fan base. It doesn’t. 20-25 teams have exceptional traveling fan bases, BSU can match the other 40 or so teams in traveling fan base and beats roughly half of them. These are the types of misconceptions that polute boards as if they are fact. This blog is an example. If this blog was accurate it would say BSU is a bad fit for the conference that is the most natural, and really only fit. Unfortunately the conferences that would consider them are across the entire country. Luckily TCU was close enough to fill the need. Reality if TCU was such a natural BCS fit why didn’t the Big-12 take them when they were about to fall apart which is their natural fit? Luckily for TCU they have 3 BCS conferences within close enough proximity and you can almost argue 5 BCS conferences that could take them. That is their bigg based on location. Best advantage over BSU when all the chaos transpired. It is a combination of resume and who is around you. Again this blog is a vanilla, not very well thought out, casual fan kind of analysis on BSU’s plight. It is like answering the question of how do you win in football game by saying you score more points. Sofork had a good point about Washington State and their geography. Frankly, The Cougars, along with Vandy, Duke and Wake should all be pushed out like Temple was from the Big East so teams like Boise, ECU, UCF or even a Hawaii can get a spot in the big leagues. If Notre Dame can be Big East for all sports but football, why can’t Duke be in the ACC for all sports but football, for example? Oh yeah, politics and money. The state politicians in Washington wouldn’t let Wazzou get pushed out of the PAC 12 and get repalced by a Boise or Hawaii. Plus, USC, Washington and Arizona State like having the Cougars to guarantee a win in conference. Why swap them for a possible loss? Fans pay to see their team win. Alabama, Penn State, Michigan, Tennessee, Ohio State…these teams have stadiums that hold over 100,000 fans. They didn’t get those stadiums by going 6-6 every year. South Carolina has all the blessings of geography (southeastern market, no pro competition until the Carolina Panthers franchise) and history of playing football for well over a century. They have a stadium that seats over 80,000 but the reason it isn’t over 100k is because they have an all-time record just over .500, the definition of mediocrity. It isn’t just geography, or fan support, or television market, or tradition. It is all of those factors. For those of you complaining about the info support of this post, you might want to read some of Kristi’s other posts. There’s one on the Pac 12 that discusses the TV markets in greater detail. Obviously BSU can’t add enough local cable subscribers to entice the Pac 12 that they are worth adding. My question to Kristi is how do they measure the impact on national cable subscribers (if the Pac 12 network is an add on subscription, for example) for individual teams? Do they do market research on the impact of adding a team? It seems to me things are going to change as they get more sophisticated at measuring this impact. You have said yourself that it’s becoming less about filling a stadium because TV is taking over. I suspect historically, it’s been a group of producers huddled up in a production meeting picking games to broadcast. But that decision could be based upon better information as networks learn how to better predict viewing habits. Sort of like google predicts search requests. The info is out there but I don’t know if it’s analyzed? How does ESPN choose which games to broadcast? I’d love to learn more about your insight on the subject, Kristi. Hey Kristi, your work started out great when you were uncovering facts about revenues and spending. Frankly, your opinions are trash and I had to quit following you on twitter because you loaded up my timeline with up to 80 tweets a day on BS about your personal life ranging from old college friends, to your d-bag boyfriend, to your parent’s rental house. So, when you start mixing your personal life tweets with your business of college sports tweets, you lose any type of sympathy from me when people attack you personally. Go back to fact gathering, keep your personal life to yourself, and here’s an idea: keep your picture off of your website. Boy, you shure are dum about the Broncos. BSU is the hottest football program in the country, and has been for years! Our record is incredibal – we NEVER loose at home! And we only loose on the road when other teams cheat or the refs screw us over (like the terrible call at Nevada when the kick was obviusly GOOD!). We have never lost on the blue turf, and that is why we don’t get invited to the PAC or Big 12. Those schools are just afraid of the Broncos!!! USC doesn’t want to take a back seat! Texas doesn’t want to play second fiddle! That’s the ONLY reason BSU isn’t in a big leage! We are more popular and on TV more than anyone – we are the top cash cow of football. If BSU doesn’t bring anything to the table, why do people say that we are “America’s Team”? We are everybody’s second favorit team! That’s why we brake all kinds of TV records all the time! The big loosers in all of this is college football fans. Fans want BSU in their conference! Why? Because we would automatically make them the best conference. Also, our fans are recognized as the best. Everyone I talk to says Bronco Nation is the classiest and most nowlegible fans anywhere! “Omaha is a market in the 70s, not Boise’s 120. Also a long-time national brand. Definitelty (and obviously by Big Ten’s decision) a more attractive addition. This argument makes no sense. The Big Ten does not want to get into Nebraska for media and they sure as hell don’t want to be in Nebraska for recruiting. They want Nebraska because Nebraska gets ratings. Because Nebraska has fans in Phoenix and Los Angeles and Chicago and New York City who will tune in every week. And because Nebraska vs. Ohio State and Nebraska vs. Penn State and Nebraska vs. Michigan are going to be games that ESPN talks about all week and EVERYBODY watches. Any talk about the size of the TV market for Boise vs. Omaha or Lincoln is worthless. Nebraska, as an entire state, has ~700,000 households, and if they’re nationally average, about 60% (or 420,000) have cable TV. That means to ABC/ESPN and the Big Ten Network, the entire state of Nebraska is worth about $2 million per year in subscriber rates (~$1.6 million for ESPN and ~$400,000 for the BTN). It doesn’t change your point, but Boise is actually market #113 according to 2011 Neilsen rankings. Would be good to get that number right next time. Why hasn’t Boise been invited to a BCS conference? Simple, they’re located in Boise, Idaho. Sure Nebraska doesn’t have much of a media market either, but they have been around since been around started. The wins are there Boise. Hopefully you can improve your academics, upgrade that stadium, keep winning, and become more of a national brand, then maybe you’ll get that invite. Pulling for ya’. Obviously we can’t compare Nebraska’s brand to Boise State’s brand. Overall, Nebraska has been there longer than BSU, better academics, national following, great product, tradition…. unfortunately BSU is still in diapers!! Dnt get me wrong, I’m a BSU fan, but Boise State have many things going against them. Even though academics are improving, they are still lacking when compared to Pac12 universities…. Chris Peterson won an award for having his players graduate. That’s important and it shows BSU commitment in improving academics. As for being a national brand, I guarantee you that if BSU keeps winning, in the next 5 years the perception will be totally different. In the direction that all this realigment thing is going conferences will overlook certain things just to get more money, BSU will bring more money if they can sustain their success… look at me, I’m puertorican, born and raised, never lived in the US, never being Idaho. Puerto Rico’s number 1 sport is basketball, american football is down the list after baseball, boxing and even volleyball, yet I consider myself a BSU fan, ever since that huge upset victory over Oklahoma in Glendale!!! What im trying to say?? If they keep winning, they are gonna become a HUGE brand!!! You talk about BSU’s TV ratings but keep in mind, they make it a practice to schedule Thursday and Friday night games when they are the only football on TV. Let’s use the Big-12. Oklahoma and Texas are the ones who are keeping BSU out. These 2 schools are expected to compete for a national championship every year. Big time schools like that are not willing to risk their national title hopes playing a scrappy team that very well might beat them on a blue field in the mountains in front of 35k people, especially when that school brings virtually nothing to the party in terms of money, market or recruits. Your site is pretty interesting to me and your topics are very relevant. I was browsing around and came across something you might find interesting. I was guilty of 3 of them with my sites. “99% of site managers are committing these five errors”. http://tinyurl.com/blwxft4 You will be suprised how simple they are to fix. Nice post Kristi. You managed to get some good debate. A lot of good points from what seemed like a broad base of fans, although a small amount. What would be interesting now, is how you are going to respond to resent events, including Boise St’s joining of the Big East. I’m not sure if BSU’s Bob Kustra sees the dilemma the Big East is putting Boise State Football in? What’s going to happen when the Big East gets excluded from BCS games cause of the “current 2012” irrelevant teams playing? Its obvious to see that, the “$BIG$ Bucks” won’t be there anymore and BSU has to travel “by contract” to play these teams regardless. And vice versa. I have to agree that Kustra might change his mind in the Spring of 2013 before his MWC/B.E. dead-line.